Found 2 file extension associations related to Kingpin: Life of Crime and 1 file format developed specifically for use with Kingpin: Life of Crime. 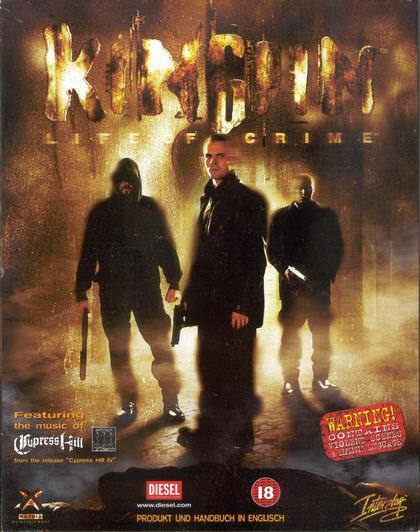 Kingpin: Life of Crime is a first-person shooter computer game developed by Xatrix Entertainment and published by Interplay Entertainment in June 1999. Kingpin: Life of Crime is a first-person shooter, in which the player takes the role of the thug on his mission of revenge. The player's health meter is a number, and when depleted the player dies. Armor can also be collected which offered protection of either the head region, the torso region or the leg region of the player. Weaponry begins with a small lead pipe but other weapons such as a pistol, shotgun, tommygun, flamethrower, grenade launcher and rocket launcher, will become available when picked up. Kingpin keeps track of weapon skills so that the player's aim is generally worse when they newly acquire a weapon and improves over use. Many of these weapons will be found hidden in rooms, but others will be for sale at the Pawn-O-Matic series of pawn shops. The pawn shop also sells health, armor, ammunition and upgrades for certain weapons. In order to reach the Kingpin, the player will need to interact with various NPCs: some wanting to trade items, some wanting quests completed and others just available for hire. Interaction with NPCs is limited to the player giving either a positive or negative response/statement. Much interaction with NPCs or the Pawn shop will require money, which is collected from dead enemies or found lying around in apartments or inside of locked safes. The player is able to hire certain goons who will the follow the player and use their own weapon to attack enemies. They feature their own damage display, similar to the player's, and can be ordered to follow the player or stay put. Some goons will also have lockpicking skills which can be used to open locked doors or safes. If you need more information please contact the developers of Kingpin: Life of Crime (Interplay Entertainment Corporation), or check out their product website.